Don't spend hours on the web looking for deals and cheap flights and hotels. Use Webjet to browse holiday package deals to New York City and find the best deals for your budget. Hassle-free Experience: Take the stress out of planning the itinerary for your next holiday. Choose one of Webjet's holiday package deals and simply arrive at the airport on time. Save Time: Let someone else handle the logistics while you focus on enjoying your break from the office. World-class Service on a Budget: Due to the competitive nature of the travel industry, packaged holiday deals often include discounted stays at the top hotels. No hidden costs: Your holiday package to NYC will be paid in full before you leave so you don't have to worry about paying extra once you arrive. The Statue of Liberty is one of New York's and North America's greatest attractions. Built in 1886, it's just under 152 feet tall and weighs almost 450,000 pounds. If you don't want to take the short boat trip to Liberty Island, you can view the famous statue from Battery Park on the southern tip of Manhattan. Want to escape the madness of the city for a few hours? Head to NYC's famous Central Park. It's full of lush pathways, and in the winter you can even ice skate across Wollman Rink. But besides its natural beauty, the park is also home to the Central Park Zoo, Strawberry Fields and the Belvedere Castle. The Grand Central Terminal is another iconic NYC building. Opening to the public in 1913 as a terminal for subway and train stations, it's been used as a set for films and tv series such as Men in Black and Gossip Girl. Inside the terminal, you'll find a painted celestial scene on the ceiling, an extensive selection of shops and the beautiful Grand Staircase. 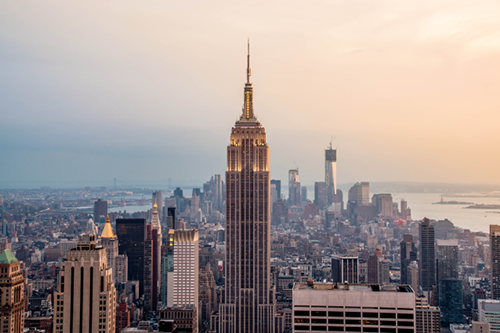 Standing at 381 meters, the Empire State Building was the tallest building in the world for 41 years. Today, it's one of the best places to get a bird's eye view of NYC. The building has two observatories where you can see as far as New Jersey, Pennsylvania, Connecticut and Massachusetts on a clear day. If you can, buy the flexible ticket so if the weather is bad you can use it another day. Times Square is one of NYC's most visited attractions. It's the location of the city's famous New Year's Eve Celebrations, and it's brilliantly lit billboards and screens, attract hundreds of people every day. There are tons of shops to explore, street performers to watch and even bleachers where you can sit and take in the scene. The best way to get around NYC is with the subway. It's cheap, with tickets only costing USD 2.75 per swipe and you'll avoid getting stuck in the city's gridlocked traffic. Plus you won't have to pay for parking which is usually impossible to find. Don't stop in the middle of the sidewalk to take a photo. You'll end up frustrating the locals and stop the flow of foot traffic. Instead, step aside so the crowds can carry on moving while you snap your picture. There is a tipping culture in New York. It's expected to tip cabbies, bellhops and servers at restaurants. A good rule of thumb is to leave behind at least 15-20% of your bill for restaurants and taxis have a system where you can add a tip percentage to the fare total. Flag down a cab like a local. If a taxi has their top light on, they are available. If it's off or the "off duty" sign is on, the driver won't stop for any passengers. Buy the New York CityPass. It's a great way to save on admission prices and skip lines at six of the city's top attractions.